This page focuses largely on USDA Natural Resources Conservation Service (NRCS) practice standards and how NRCS works with farmers by providing technical and financial assistance. The next section in this module discusses many of the practices relevant to animal agriculture in greater detail. Why is conservation important to animal agriculture? Why is conservation important in animal agriculture? Conservation is key for farmers interested in protecting natural resources while producing food, fuel, and fiber from working lands. There are a variety of conservation practices that can be voluntarily implemented to protect natural resources for surrounding ecosystems, community, and future generations. Conservation practices can have both on-farm and off-farm benefits and can be customized to the unique location, soils, and needs of each farm. Conservation practices are site-specific, not one-size-fits-all. They must be planned and installed with the characteristics of the individual site in mind. Many conservation practices are voluntary and incentivized through technical and financial assistance. If a farm is subject to regulatory oversight, NRCS practice standards may not meet the requirements of state or federal regulations or permits. Producers should double-check those requirements rather than assuming that they will suffice. Photo 1. Animal agriculture operations are very different from farm to farm. Because manure is one of the largest by-products of animal feeding operations, conservation practices are often designed to increase the farmer’s ability to manage manure as a beneficial resource and reduce risk associated with manure application. Nutrients (whether from manure or from inorganic fertilizer) not taken up by crops can run off from fields or leach to groundwater through rain events or irrigation. Conservation practices can have beneficial impacts on water quality, wildlife habitat, and air quality. Adopting practices that result in manure applications that are well-timed, at agronomic rates, and away from sensitive locations can help farmers make significant positive contributions to water quality. Conservation practices are important in grazing operations to improve soil and vegetation health and to protect water quality and wildlife habitat. For example, restricting livestock access to a stream or creek reduces the chance the animals will deposit manure or urine in the water, break down stream banks and beds, and/or stir up sediment. Rotational grazing can provide important rest and recovery time for vegetation and allow wildlife cover for nesting or raising their young. USDA NRCS was established in 1935 to work in close partnerships with farmers and ranchers, local and state governments, and other federal agencies to maintain healthy and productive working landscapes on a voluntary, non-regulatory basis. Originally known as the “Soil Conservation Service,” the name was changed to NRCS in 1994 to better reflect the broad scope of the agency’s mission. Learn more about the history of NRCS. The National Office is located in Washington, DC, and is where national policy, procedures, and conservation practice standards are developed. State offices adopt these standards, either directly, or with changes that make the standards more stringent. The local or district office (Photo 2) works directly with farmers and ranchers to assist them in protecting natural resources by implementing conservation practices on working land. They provide technical and sometimes financial assistance for conservation practices. Learn more about how NRCS is organized. Photo 3. 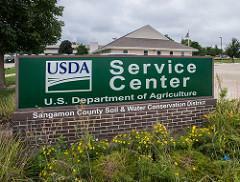 This local conservation district office is located in the same building as the local USDA service center. Conservation districts are local governmental units responsible for protecting and conserving natural resources in their assigned geographic area. They are governed by a locally-elected board. In some states, they may have a different name, such as soil and water conservation district or natural resource conservation district. There are over 3,000 conservation districts, nationwide. Conservation districts often partner with NRCS (Photo 3) to work with local farmers, ranchers, and other landowners to implement conservation practices that help address issues of local importance. By working together, NRCS and the districts can more efficiently address conservation needs. EPA’s role in conservation is primarily regulatory but also includes non-regulatory, voluntary, and incentive-based programs such as the Clean Water Act Section 319 funding. This program provides grants to states and tribes to reduce nonpoint source runoff. EPA also develops partnerships with industry. One such example is the EPA AgSTAR program, which works with farmers on a voluntary basis to encourage the use of anaerobic digesters for manure treatment and renewable energy generation. Recommended resource: EPA National Agriculture Center includes information on regulations, compliance assistance, and partnerships. Photo 4. State environmental agencies are generally tasked with enforcing the Clean Water Act and Clean Air Act. Many Clean Water Act and other programs that originate with federal statutes are implemented by State, Tribal, and Territorial environmental agencies. Those programs generally work directly with local partners and landowners to develop watershed plans and implement nonpoint source control measures. 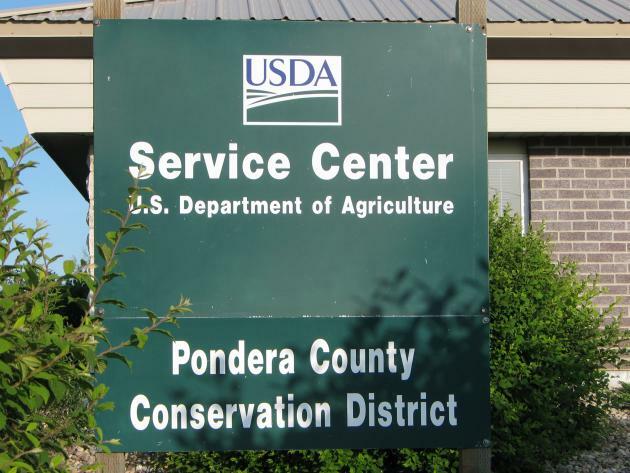 Those partners often include Conservation Districts for agricultural projects and often utilize resources from multiple agencies and organizations, including USDA. 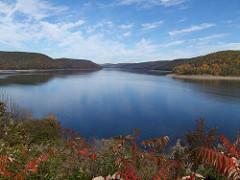 Under Section 319 of the CWA, states, territories, and tribes receive grant money that supports a wide variety of activities to control nonpoint source pollution, including technical assistance, financial assistance, education, training, technology transfer, demonstration projects, and monitoring to assess the success of nonpoint source implementation projects. Recommended Resource: Nonpoint Source Success Stories features stories about nonpoint source impairments with documented water quality improvements attributable to restoration efforts. For the most part State agricultural Departments do not play a direct regulatory role in enforcing the Clean Water Act or Clean Air Act. One major area where state agriculture departments are involved in the implementation of conservation practices are in the case of animal mortality, both routine and catastrophic. Most states have regulations that specify appropriate methods for carcass disposal. State agriculture departments may also develop programs that encourage the use of conservation practices through cost-share, educational outreach, or other methods. There are over 160 conservation practices for which national standards have been developed. Any that are adopted by a state can be implemented in that state to assist farmers and ranchers with their environmental stewardship efforts. Farmers and ranchers should use the conservation practice adopted by the state, rather than the national standard. To find your state’s approved practice standards, contact your local NRCS office for assistance. Photo 5. Many different conservation practices are used on animal agriculture operations. What are conservation practice standards? Photo 6. 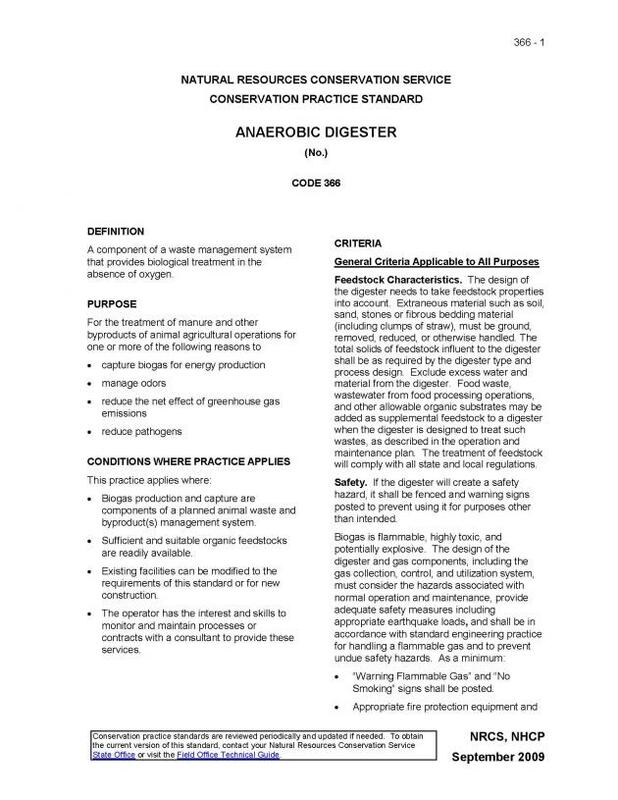 A screenshot of the Anaerobic Digester conservation practice standard. Click here to download the full-size PDF version. Specific practices and details about each practice are included in the next section, Conservation Practices in Animal Agriculture. How are standards for practices developed/updated? Practice standards may be newly identified or change over time based on new science and technology. They are periodically reviewed and updated, usually every 5 years. Any new or updated practice standard is reviewed by technical experts in pertinent fields and is available for review and comment by the public before it is adopted. NRCS publishes national conservation practice standards in its National Handbook of Conservation Practices (NHCP). If a practice is adopted by a state, the state has some latitude to develop a more stringent or specific version that fits typical conditions or situations in that state. Recommended Resource: The first 12-13 minutes of the video “Use of NRCS Conservation Practice Standards and Specifications” describes the process of how a new standard may be identified as well as the process used to validate it and the sections included in a standard. It is presented for NRCS staff, but is useful for others that work with farmers who want more background on how a practice standard is developed and what is required to be in a standard. Photo 7. Conservation planning needs to consider individual farm goals and current conditions. A conservation plan is a record of the conservation practices implemented on a farm or ranch. It may include sub-plans such as one for grazing management, comprehensive nutrient management, wildlife management, or others. Conservation planning starts with a farmer or rancher recognizing a problem area or wanting to improve some aspect of the farm or ranch. The next step is to contact NRCS. NRCS helps the farmer or rancher review and analyze the current conditions for possible solutions. Depending on the preferences of the client, certain practices may be selected to include in the conservation plan. Conservation plans are voluntary and are developed by NRCS at no cost. How do farmers access technical or financial assistance for conservation? Contact your local NRCS office to access technical assistance in implementing conservation practices. If conservation practices are eligible for financial assistance (cost-share), farmers complete and submit an application. If approved for cost-share, a contract is developed that specifies what will be done, when it will be done, and how much assistance will be provided.